It is a plan, produced to support the extension of the Established Key, or its legal approval, that provides the first definitive indication of where the Bideford quays lay. Fielder dates this as c. 1690, which seems too early. Carter and Carter date it 1717 (which, from the evidence below, seems a more likely date). On the Eastern side it shows Mr Doubty’s Key next to the bridge, The Key in front of John Davie’s great house and Strange’s Key further northward. 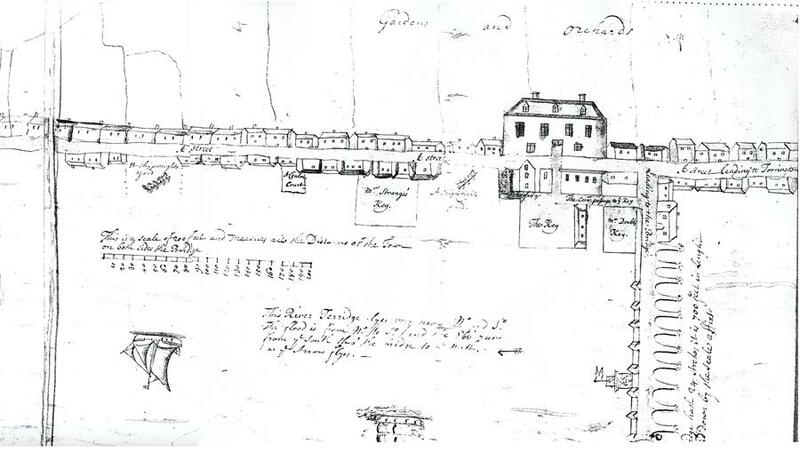 There are a number of shipwright’s yards marked and the plan also confirms the original extent of the Established Key, by marking the sections considered to be new.